The Children Win campaign ensures that child rights are protected, preserved and respected before, during and after the organisation and delivery of Mega Sporting Events (MSEs), and that every event ensures a positive legacy for future generations. Since 2014, we have been increasing the pressure and demanding change from MSE organisers who have turned a blind eye to human rights violations in the past. 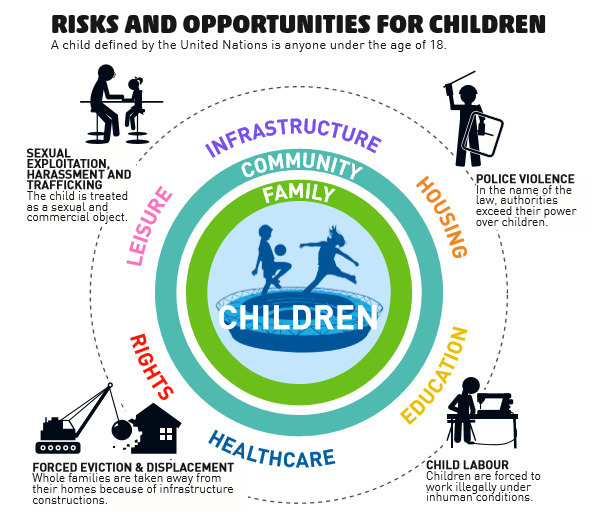 We have compiled irrefutable evidence that major events – such as the FIFA World Cup™ and the Olympic Games – can directly harm children or expose them to risks such as forced eviction, violence and exploitation. This needs to stop. We share the voices and stories of children impacted by Mega Sporting Events – such as Naomy, Gabriel, Pérola and Helena. Naomy features in The Fighter, the story of a teenager whose home in the Vila Autódromo suburb of Rio was destroyed in the build-up to the 2016 Olympic Games. We ensure our campaigns are based on hard facts and first-person accounts. Our work is always backed by evidence and research – such as our report on Rio 2016.
undertake human rights due diligence. We hold meaningful discussions with sporting bodies and other key stakeholders, sometimes in coalition with other civil society organisations, to ensure our voice is heard and that commitments made by event organisers are implemented, and the impact on children and their communities is measured. We also share our expertise to encourage transparency and accountability to implement real and sustained change. This includes working directly with the IOC, FIFA and UEFA. Our aim is to stimulate debate between people and organisations who can successfully instigate change. We listen to disparate voices who challenge the status quo, and who give constructive criticism with realistic and viable alternatives. We aim to inform and explain the issues around child rights and MSEs to our audience – such as how the UN Guiding Principles on Business and Human Rights are being incorporated by sports governing bodies, and what this means in terms of real action.